Last night’s decisive Western Conference semifinal Game 7 between the Anaheim (No Longer Mighty) Ducks and the Los Angeles Kings turned into the swan song for the great Teemu Selanne. The Finnish Flash finished his 23 years in the NHL (15 of them in Anaheim) with 1457 points (684 goals, 773 assists) in 1451 games. In other words, a first-ballot entry into the Hockey Hall of Fame. But not into the Western Conference finals, thanks to Kings goaltender Jonathan Quick, who has the Best. Goalie. Name. Ever. Here’s Quick stoning Ducks forward Corey Perry on a first-period penalty shot that – with the Kings leading 2-0 – could have changed the entire complexion of the game . . .
. . . but didn’t, eventually resulting in a 6-2 drubbing by the Kings. In a classy tribute, the Kings – after the traditional series-ending-handshake line – stayed on the ice to salute Selanne. That’s just one of the reasons hockey is the greatest sport of all. 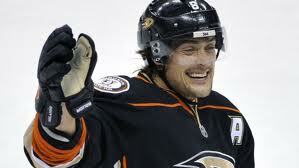 And Teemu Selanne makes two. This entry was posted in Uncategorized and tagged Anaheim (No Longer Mighty) Ducks, Best. Goalie. Name. Ever., Corey Perry, Hockey Hall of Fame, Jonathan Quick, Los Angeles Kings, penalty shot, Teemu Selanne, The Finnish Flash. Bookmark the permalink. Greatest sport of them all.